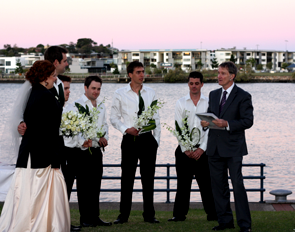 Peter’s aim as a wedding celebrant is to work closely with you to provide a ceremony that is in keeping with your desires and values. A ceremony you dream of is one that you deserve. It's important for you to know that your ceremony is professionally organised so that the demands of your wedding day are minimised with a relaxed and friendly approach. His service to you will include: up to three meetings, assisting with ceremony preparation, a rehearsal (if required and within reasonable distance), facilitation of all paper work and submission of documentation to relevant authorities, arrival at the venue at least 45 minutes prior to the ceremony, conducting the ceremony and any other assistance you desire. There's nothing more meaningful than a poem or story to beautify a special occasion. As Peter has a background as a poet and a story teller a personalised poem or story can be provided as part of the ceremony. This service is inclusive in the fee for the ‘Personalised Plus’ ceremonies package. I believe that all wedding ceremonies are special. I guarantee to deliver your choice of ceremony in a professional, relaxed and friendly manner. Peter provides a no obligation first meeting where a complimentary wedding pack is given, portfolios can be viewed and your wedding needs are discussed. The second meeting is a longer meeting where the paperwork is filled out (via a computer program), a draft of the ceremony is formed and questions asked for the personal poem. Birth certificates and, in the case of a remarriage relevant documentation need to be sighted. In an outdoor venue it is important for all of your guests to be able to hear the ceremony. Peter provides a top of the range wireless microphone and amplification system so that your guests feel included in your special day. If needed, a table and chairs for signing are supplied. There are four different wedding ceremonies packages I offer and that you can choose from, in our first meeting we can discuss all four and choose the right one for you. Schedule of Fees (as at 1/1/2013). Peter’s "Personalised Plus" weddings are highly valued by couples. The wedding of Dee Keane and Nick Savage was one such wedding. Watch and enjoy. Wedding ceremonies are conducted throughout Australia, however outside the South East Queensland Corner (Brisbane Region, Gold and Sunshine Coasts) additional costs may be incurred depending on travel distance and time. For example, Byron Bay (2 hours from Brisbane) $100, Agnes Waters (5 hours from Brisbane) $300, Stradbroke Island (Ferry Cost for car); other capital cites e.g. Melbourne, Sydney (airfare and possibly one night’s accommodation – depending on time of wedding). Rehearsals at wedding venue may incur an additional cost, depending on location, i.e. greater than 15 kilometers.